Dan Pomerantz has come down from the mountains. For the past eight years, Pomerantz has operated Rebel Grown near Garberville in southern Humboldt County, earning a reputation for superior cannabis genetics and high-potency flowers. 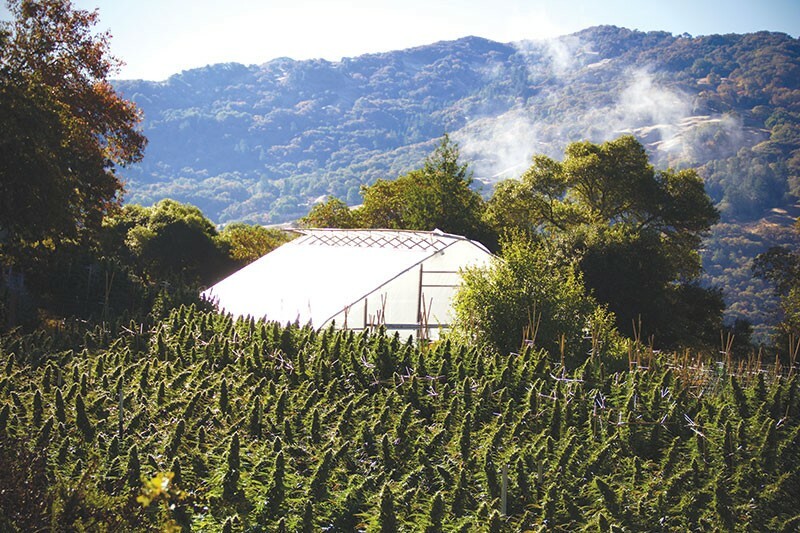 His 40-acre farm (pictured) is in an area called Palo Verde, a storied cannabis cultivation zone pioneered by back-to-the-landers in the 1970s. But in the rapidly changing cannabis industry, he's realized growing high-quality weed and seeds in a remote mountain enclave is not enough. What was once an area of small-scale, mom-and-pop growers has devolved into an arms race of larger and larger operations chasing ever-falling prices. "It's sad," he says. "That's what's going to happen around the state." So Pomerantz, 35, and his family recently moved to Santa Rosa. It's part of a move to scale up and diversify his business. While he's still at the farm several days a week, sales calls, meetings with attorneys and other business made living on the property full-time untenable. "I'm fighting for survival in an industry about to get a lot of competition," he says. Santa Rosa's CannaCraft distributes his seeds. Rebel Grown is about to launch its own brand of flowers, vape pens and "raw resin." Raw cannabis is extracted from fresh, frozen plants. Emerald Triangle growers like Pomerantz who don't develop a brand or align with distributors face a dicey future as big money pours into an industry about to go fully legal next month. "Get big or get out" has been common wisdom. "Go big and get branded, or get out" seems like even better advice. So far it seems to be working for Pomerantz. His says his seed sales have increased 350 percent since 2011. He chalks that up to marketing and use of social media. He has high hopes for this weekend's Emerald Cup, where he will sell his wares in classy black-and-white packaging. "I'm almost nervous about the demand this year," he says. "I'm really excited." His passion is breeding cannabis and getting his seeds and flowers into the hands of consumers and growers who appreciate his efforts. He and his team have developed their own strains based on tweaks to popular genetic lines and selective breeding. Rebel Diesel and Diesel 2.0 are two strains he points to as market standouts. Rebel Grown's glossy 2017 seed catalog features 28 strains that are aimed at growers and consumers alike. "Growing seeds is easy," he says. "Real breeding takes a lot of devotion." But in the new cannabis marketplace, branding will be key to making sure his efforts reach consumers.